I forgot to include a list of preserves that photographs came from at the end of my Wild Things talk! So click ON THIS LINK to find a list to some preserves that you should visit. 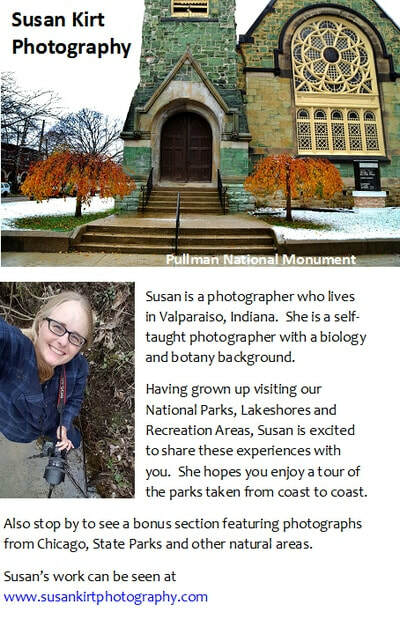 Join Susan Kirt, local photographer, on March 9, 2019 from 2:00 pm - 4:00 pm at the Indiana Dunes National Park Visitor Center (1215 IN-49, Porter, IN 46304) for a "Photographing Duneland" presentation. 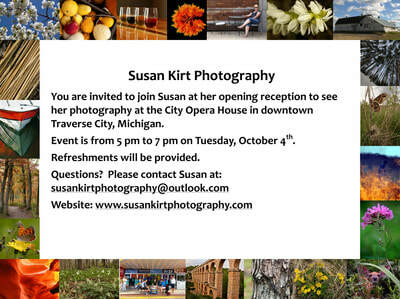 Bring your camera and cell phone to learn about camera settings and different types of photography. There will be a short presentation of about 30 minutes and then, weather permitting, a carpool to a different location. Please dress for the weather. Listen to my recent Indianapolis public radio interview that aired on the Curious Mix program on February 7th, 2019 as I talk about photographing Northwest Indiana's rare dune and swale habitat. This photography project has been made possible by an Indiana Arts Commission Grant. The 5.5 minute audio segment is part of a broadcast entitled "Unexpected Art" and starts at marker 14:58. From the Curious Mix website you want to listen to the episode aired on February 7th. It is entitled "Unexpected Art." 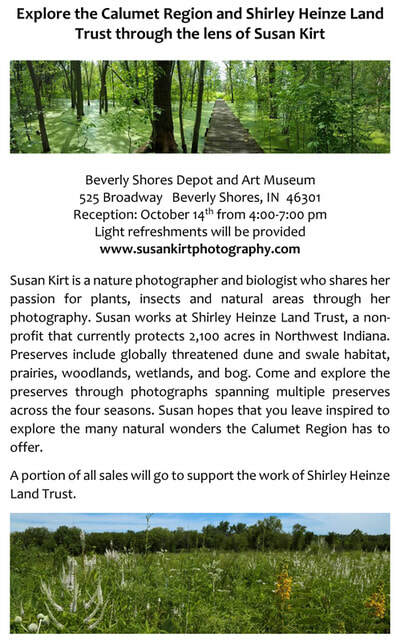 From July through September 2019 if you are passing through the Indianapolis International Airport, make sure to look for my photographs displayed as part of the Indiana Naturally exhibit! A Visit to Indiana and Africa Savanna's August 2019. A single artist display at Uptown Cafe at 1400 East Lincolnway Valparaiso, IN 46383. Check out my photograph from Ambler Flatwoods on the cover of the 2018 Shirley Heinze Land Trust Fall 2018 Newsletter! ﻿﻿Thank you for visiting my website. For more information on hiring me for a photography job or to purchase any of my award winning photos, please click on the button below. To see more arthropod photographs, please check out the following link: Macro.